This document outlines how to access and use the Video Editing Tools in Kaltura MediaSpace. Creating and Editing Interactive Video Quizzes. See link for more information. Kaltura's documentation on these tools is available in their Kaltura Video Editing Tools User Guide. Launch Chrome or Firefox and go to Kaltura MediaSpace: mediaspace.wisc.edu. If you need more information on how to log in to MediaSpace please see Kaltura - How to Log in to Kaltura MediaSpace (UW-Madison) . 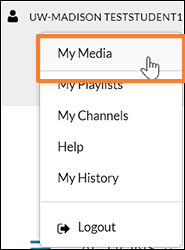 Option 2: Click on the video thumbnail from the My Media page.